It's time for another round of Gift Guides, and this time it is centered around the men in our lives. While I am not going to post the things I bought for Rory, I will post some stuff that I have gotten him in years past or things that he and my dad would just love. Enjoy. 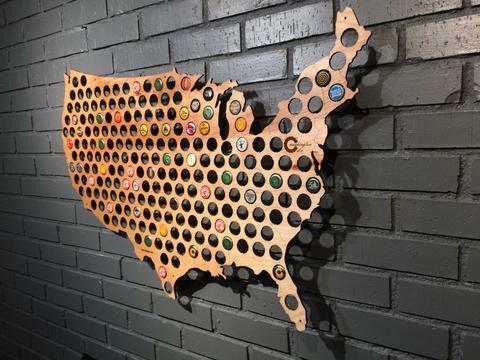 A couple years ago, I got Rory a beer cap map. I chose our state of Nevada. They have each state or a whole map of the United States. Rory has definitely been filling it up. Anytime he tries a new beer or has a favorite, he keeps the cap and puts it in the map. This has been a favorite gift of his. Another thing Rory loves are Stance socks. 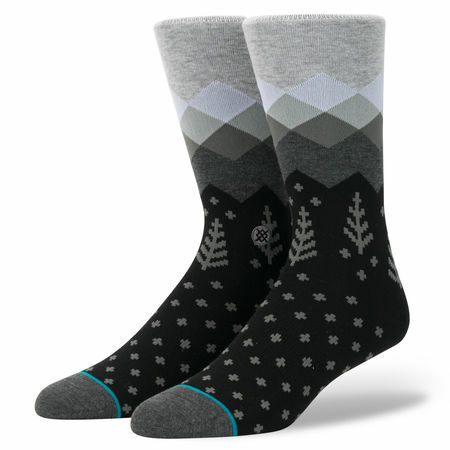 These socks are amazing. They hold up for a long time, come in extra large (ahem for men who have size 14 feet) and have the best prints on them. I even own a bunch of their socks. 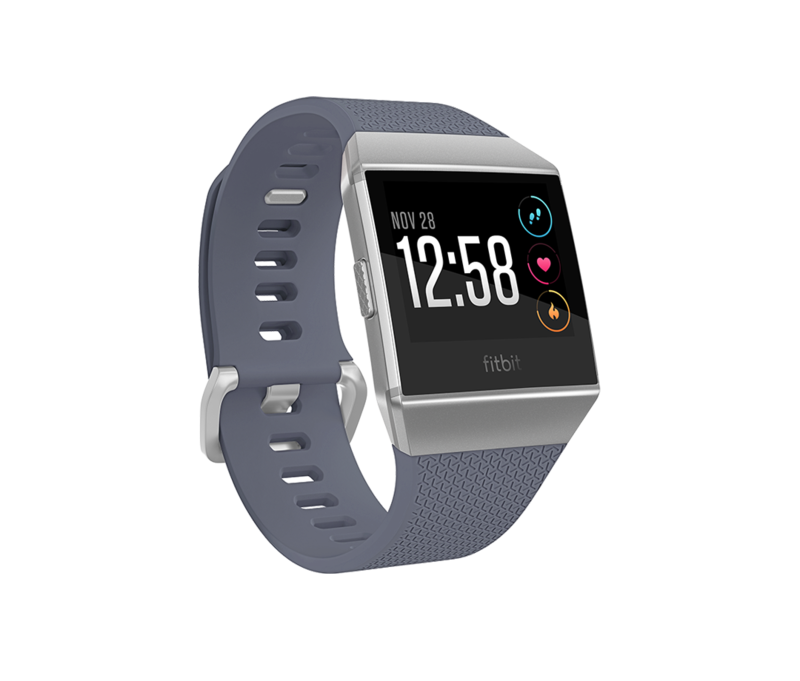 Rory really wants a Fitbit Ionic watch. We both used to have the Garmin Vivoactive, but I have since got a Fitbit Charge 2. He wants more of a smart watch, so he has chosen the Ionic. From the commercials, they seem pretty awesome. Rory bought himself a Dollar Shave Club membership a few years ago and he loves it. You can buy monthly packages for the guy in your life. He loves it because he never has to go to the store for razors and you change them out all the time, so less razor burn. I have even used it and thought about a membership. I was browsing Uncommon Good and saw some coffee that I know my husband would be intrigued by. I am not sure if it is good or not, but the reviews say it is. 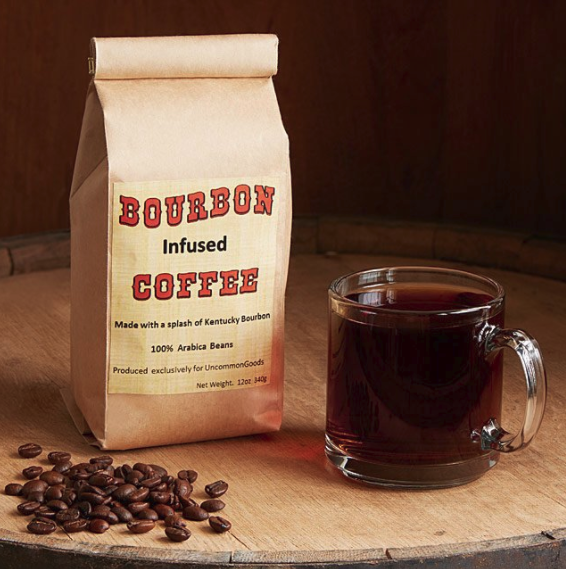 This coffee is infused with small batches of Kentucky bourbon. How many of you love Lush products? I know I do. When I visited one time, I was looking for Christmas gifts and the sales rep showed me all sorts of products. 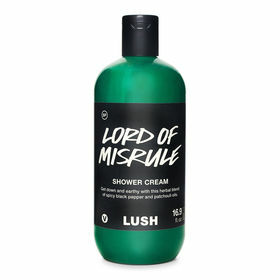 I asked for a shower gel for men and she pointed me in the direction of Lord of Misrule. It has an outdoorsy scent with a hint of vanilla. She used it on my hands and I feel in love with it. I kept smelling my hands the entire time I walked through that mall. This stuff is amazing. What are you getting for the guys in your life? Did you all spend soooo much money yesterday? Because I did. I feel like I got everyone on my shopping list done, but two people and a few smaller items for the girls. I shopped and shopped and didn't get much else done. Whoops. Anyways, I am back to recap our fun Thanksgiving weekend. Be prepared, there are some awesome pictures of my family dressed up. 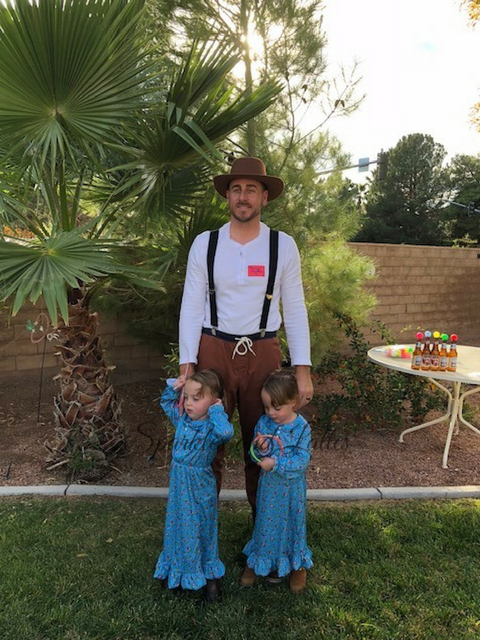 My husband may not dress up for Halloween, but he always does for these family Thanksgivings. Enjoy. Wednesday we got up to finish packing and grab some breakfast before going to the airport. We got a text saying our flight was delayed and realized we could get a big breakfast before. So we did just that. Then we came home to grab our bags, say goodbye to Walter and were off to the airport. 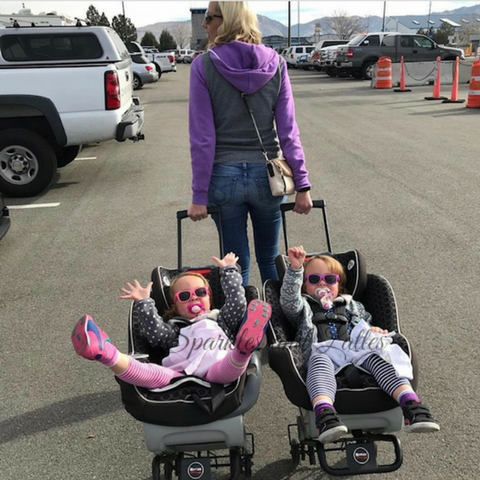 We borrowed car seat caddy's from another twin mom friend to pull the girls car seats. While I loved this, I just wish we would have checked the car seats on the plane. We had pre-check, so security was a breeze. We waited for our flight to arrive and then we got settled in quickly. The girls sat next to Rory and I was across from them. 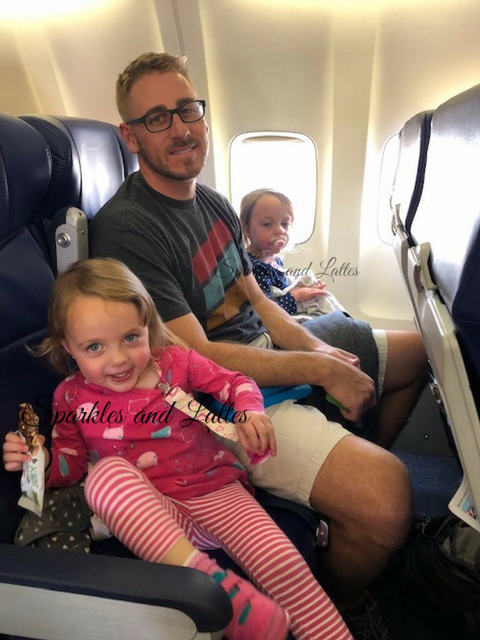 The girls loved the airplane. We got into Vegas and headed to the rental car place. Everything went smoothly other than putting our car seats into the car. It isn't a Toyota, so it took a bit longer. Plus it was HOT. We drove right over to Rory's aunts house to see everyone. 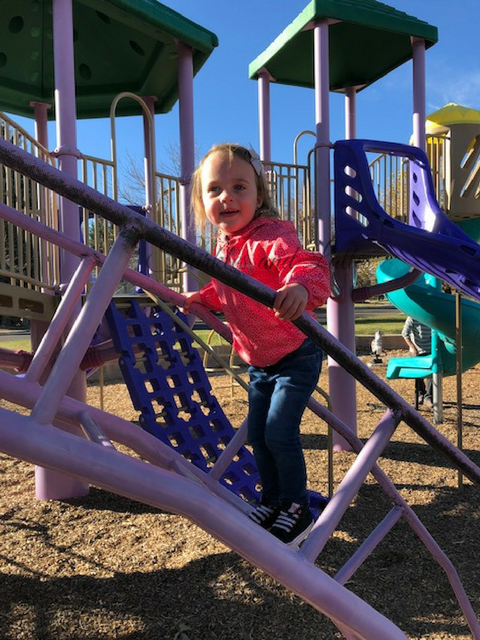 The girls got to play with family and we all got to catch up. We had pizza and italian food that evening and called it an early night. We stayed with Rory's cousin, but they were out of town for a funeral, but their son was there, so we spent the evening talking with him after the girls went down. Thursday was Thanksgiving and we got up bright and early to head back to Rory's aunts house for a brunch. 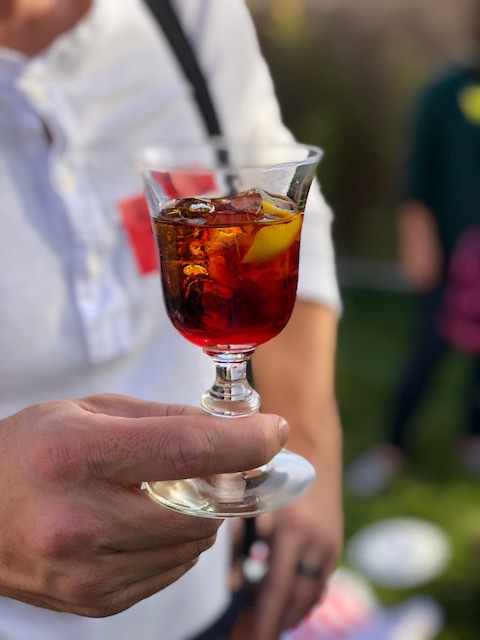 We dined on mimosas and bloody mary's (for the adults), smoked salmon, New York bagels (flown in from there), funeral potatoes, a cheesy egg chorizo casserole, carrot muffins, cucumber salad, fruit salad and bacon. I am sure I am missing something else, but it was all so good. 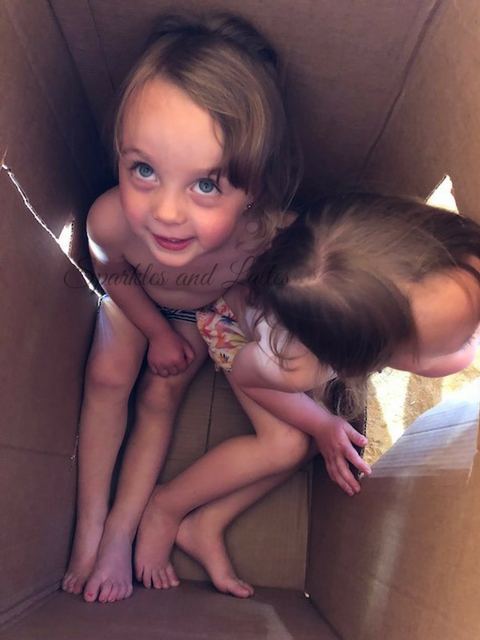 A cousin built the girls a house out of a box and they loved it. We stayed there until 12:30 and then took the girls back to the house we were staying at for a nap. I had some coffee and watched football while they slept. Then we headed to another one of Rory's cousins houses for Thanksgiving dinner. We had a traditional Thanksgiving dinner with turkey and all the fixings, plus ham and a few other items. 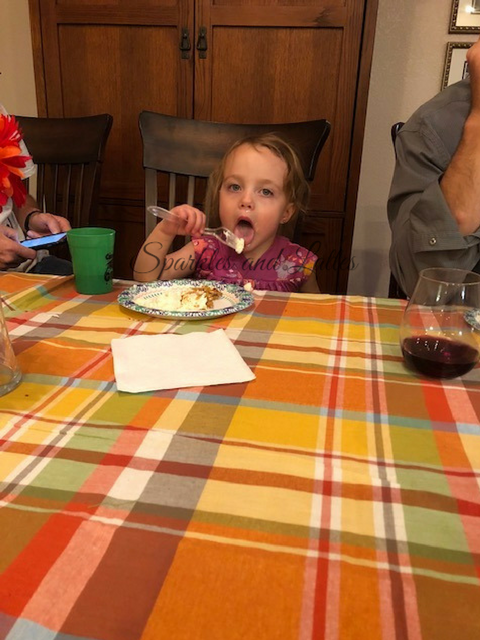 Then we had pie for dessert and the girls loved it. They also loved the dance off that happened after. We went home and hung out with Rory's cousin again and talked for hours. It was so fun and definitely needed. Friday morning we got up and I headed out to grab a dozen donuts from a shop that had amazing reviews. They were sooooo good. Thankfully we shared so I didn't eat them all. 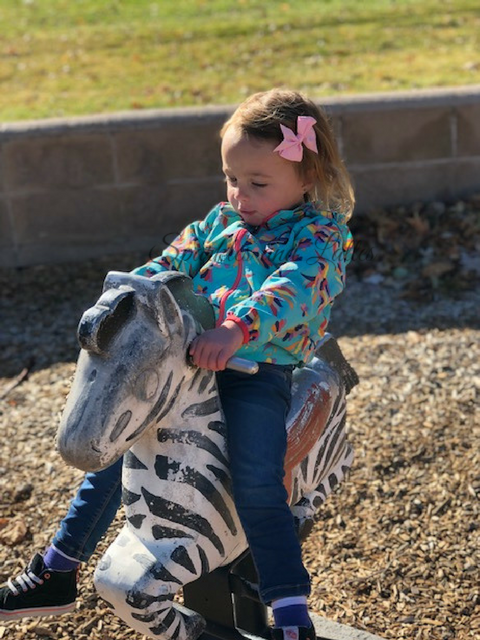 Next, we dropped the girls off at their great aunt's house and Rory and I went out to do some late Black Friday shopping. We wanted to browse around a bit and see if we could find anything for the girls, but we didn't. We found some stuff for ourselves. Oops. Then we went back to the house we were staying at to get ready. 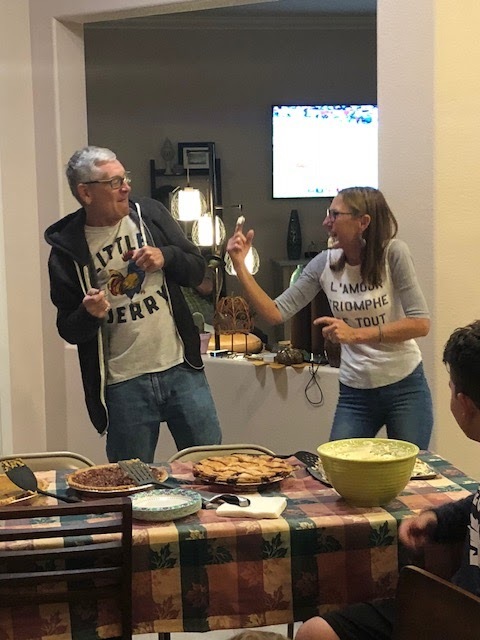 When we do Thanksgiving with Rory's dads side of the family, they think of a theme and we all dress like that. I have only done three of these as we split our Thanksgivings, but they are so much fun. 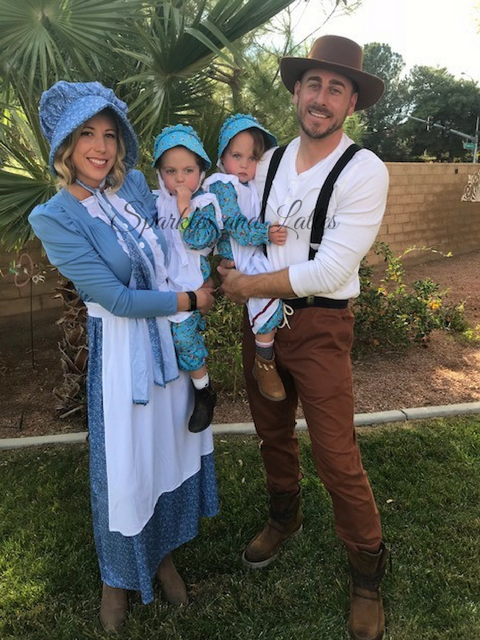 This years theme was Chuckwagon/Wild West. 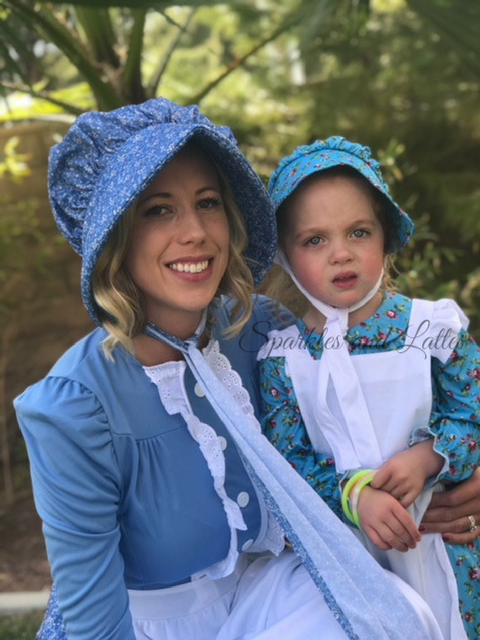 I searched google for inspiration awhile ago and bought some Little House on the Prairie themed costumes the day after Halloween. This is what we came up with. 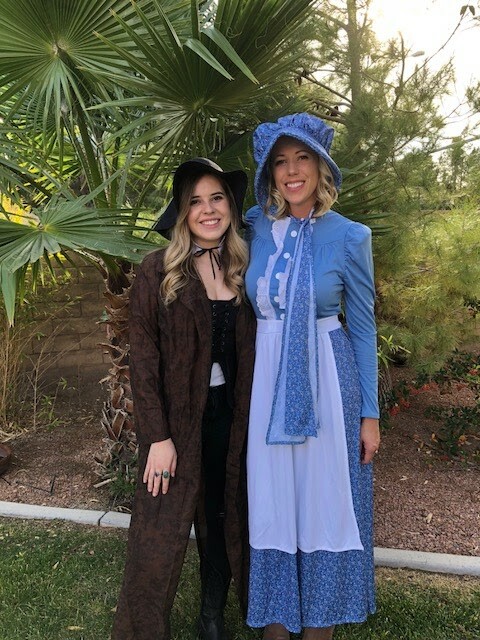 We had a chuckwagon themed dinner with smoked chickens, smoked brisket, Salisbury steak, homemade mac n cheese, asparagus, chili, salad and rolls. It was all very good. Then for dessert we had ice cream, pie, homemade caramels, fruit and cheeses. Saturday morning we got up at 4 am to make a 7 am flight. 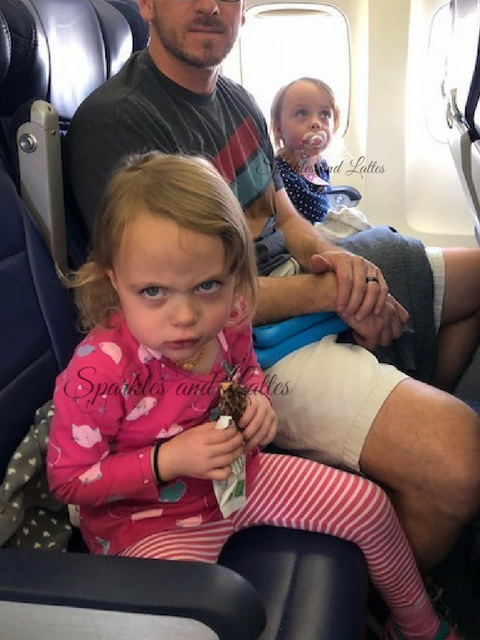 We had to get ready, drive to the airport, drop off our rental car and get to our plane. It went very smoothly and we were on time. We got into Reno, got our things and headed home. The girls fell asleep on the way home, so we grabbed some coffee and let them sleep in the car for a bit. 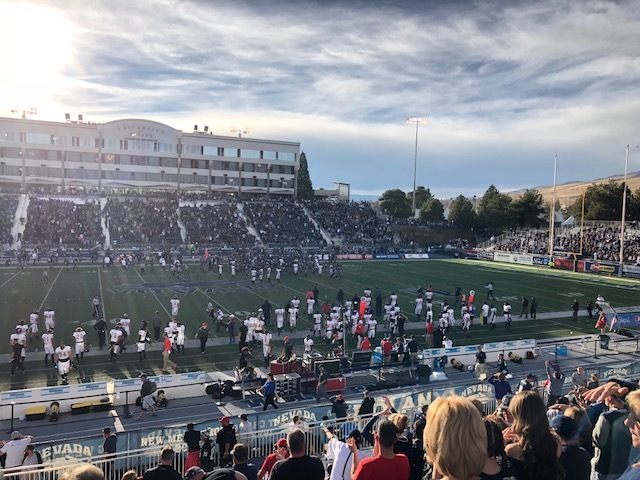 My cousin came over, so we woke the girls up and Rory and I headed out to the last home football game against our rivals UNLV. We had a chili cook-off tailgate that I helped host and that took up the majority of the time I was there. Then the game. 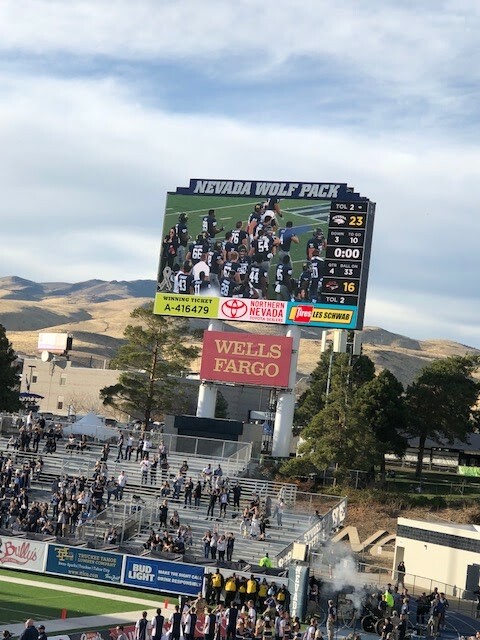 The Wolf Pack beat UNLV to keep the Fremont Cannon. This is huge. 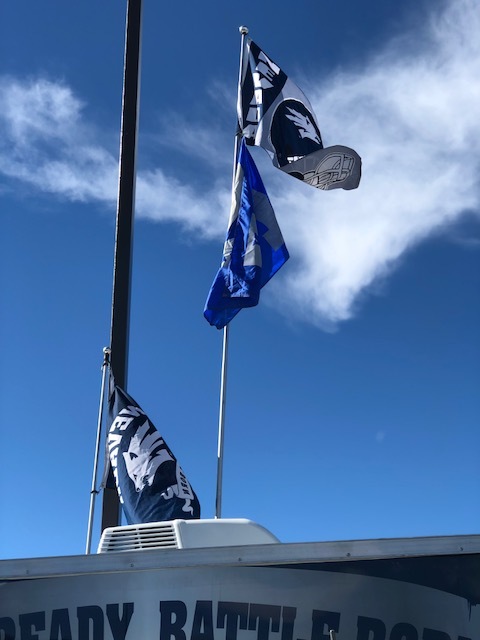 Whichever team has it, paints it their colors and it is the biggest trophy for both schools. 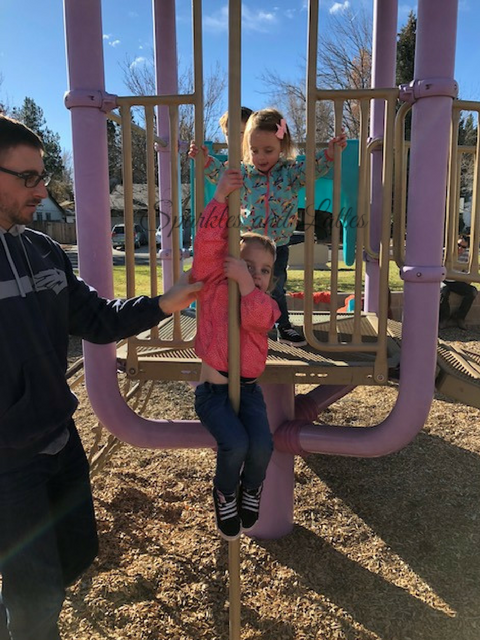 We came home after the game and were exhausted, but we took the girls to the park. We let them play for a bit, but it started getting dark outside, so we said we can go look at the ducks in the river and see how full the river was. 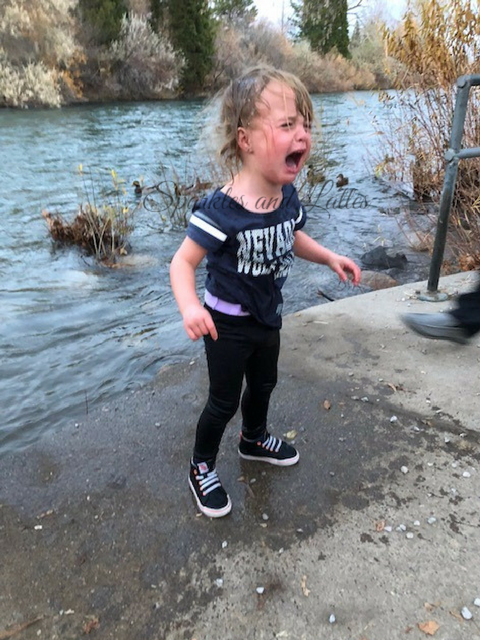 The girls started throwing rocks in the river and we told them to move back from the edge because you don't want to fall in. Not a minute later, Avery threw in her last two rocks and fell in. I grabbed her quickly. Luckily, it was about 8 inches deep, her face went in for a second and the river wasn't fast moving. She was screaming, but ok, so I took a photo as a reminder. We had the girls wagon, so we put them in that and rushed home. I gave the girls baths right away to warm Avery up and then we fed them dinner. Avery was totally fine, just cold. As the evening went on, I felt sick to the my stomach and was just tired. I went to bed early and sweated out my fever. I still felt off on Sunday, but I am better now. Sunday we got up and went to breakfast before meeting my parents at a ranger station to get a Christmas tree tag. 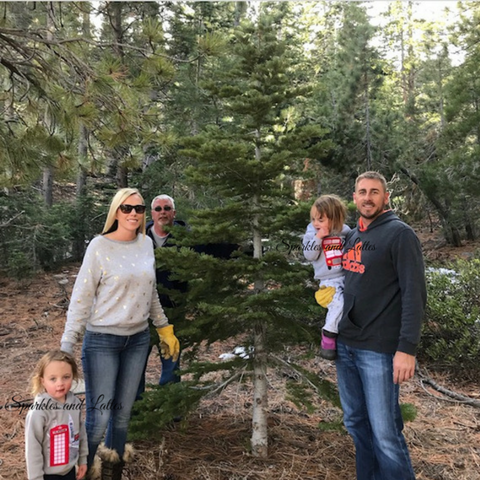 Each year we go out and cut down a Christmas tree the day after Thanksgiving. Since we were not there this year, we missed out on going with my family and friends. But my parents came out a second time with us and we went to a new area. My mom watched the girls while Rory, my dad and I searched for a tree. It took some time, but we got one. We have to cut quite a bit off the bottom, but that means more firewood for next year. And this tree is beautiful and different from the pinion pines we usually get. After getting our tree, we headed home where Rory and my dad worked on the rain gutters before all the rain came down. My mom and I played with the girls until it was lunch and nap time. Once the girls were down, I headed to the grocery store and Target for a few things. By the time I got out of the store, it was pouring hard. 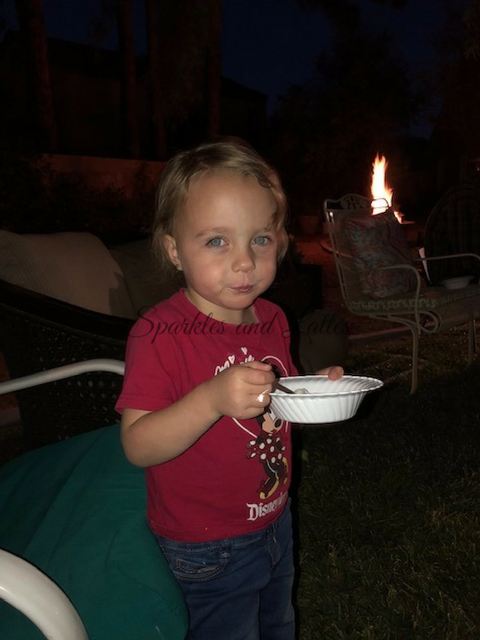 I got home to a nice fire burning and toddlers running around being crazy girls from being cooped up. I made a mushroom and wild rice soup in the Instant Pot and paired it with a kale salad and some bread. After the girls went down, we prepped our Elf on the Shelf homecoming and finished picking out Cyber Monday deals that we wanted to buy. Today is Cyber Monday which means I will be shopping all day, so I won't be doing a traditional post today. I should have all my photos edited and a post ready to go tomorrow. Happy shopping all! Tuesday: Salads (to prep for the holiday feasts we will be having. Saturday: We have our rival home game which happens to be the last game, so probably out. 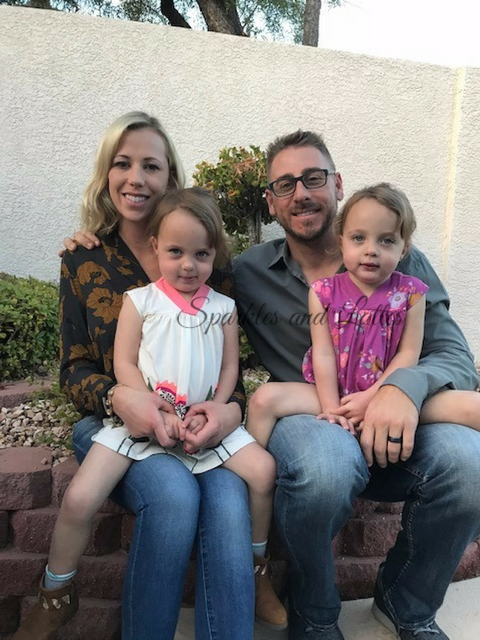 Each holiday season that we have experienced with the girls. 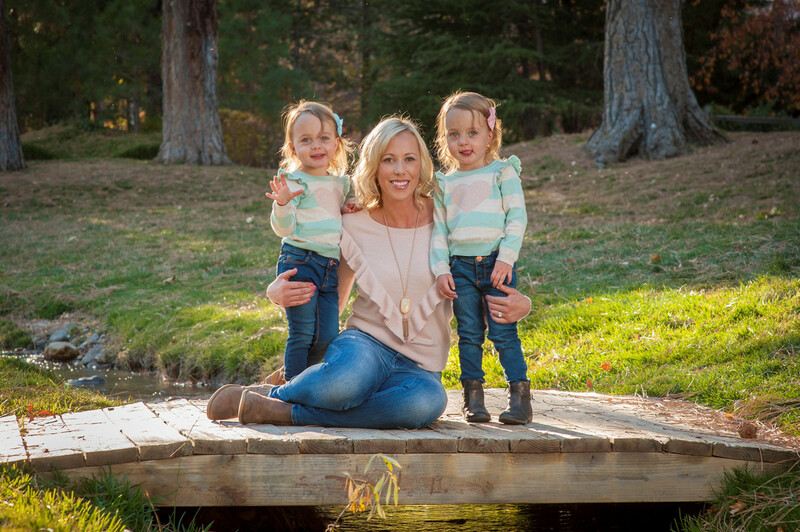 Love this time of year and how we get to share it with the girls now. The holidays. I am so excited that they are here. I am even more excited to see how it will all play out this year. Working and trying to get my cases done before the holidays. I have started Christmas shopping, decorating and getting the house all festive and cozy. Nothing. Ok maybe last minute shopping in actual stores. I love to buy everything online. My Christmas shopping lists for Monday. Cyber Monday where I do 85% of my Christmas shopping. Let's hope I can be good and not buy myself anything, or not buy myself much. I am still reading The Husband's Secret. I just haven't had that much free time lately and when I do, I binge my favorite tv shows. But I hope to start reading the Marriage Pact soon. I am watching Jane the Virgin on the CW app (total guilty pleasure), This is Us, Grey's Anatomy, Million Dollar Listing LA, Modern Family and Ozark. I started Ozark on Netflix and I am loving it so far. It has a feeling of Bloodline, but still different. Oh and lots of Hallmark Christmas movies. Nothing. I wish I was listening to Christmas music, but some of my co-workers are ba-humbugs. 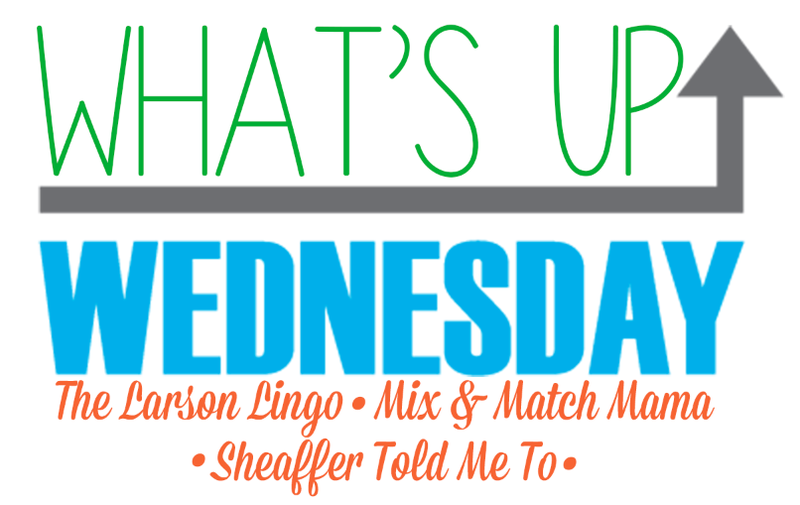 I am wearing my new J Crew sweater blazer and a few other things that I bought recently, but most of them appeared in my previous What's Up Wednesday post. Trying to be good and not buy everything. 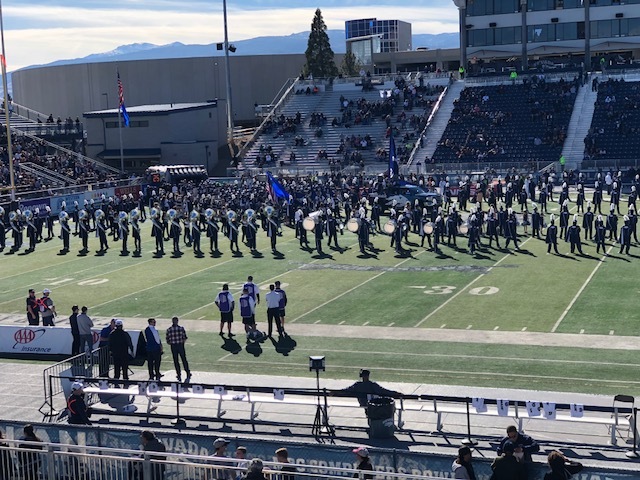 We are going to our last home game against UNLV and then Sunday we are going to cut down a Christmas tree. I can't wait. Christmas and all the fun things we do for the holiday. 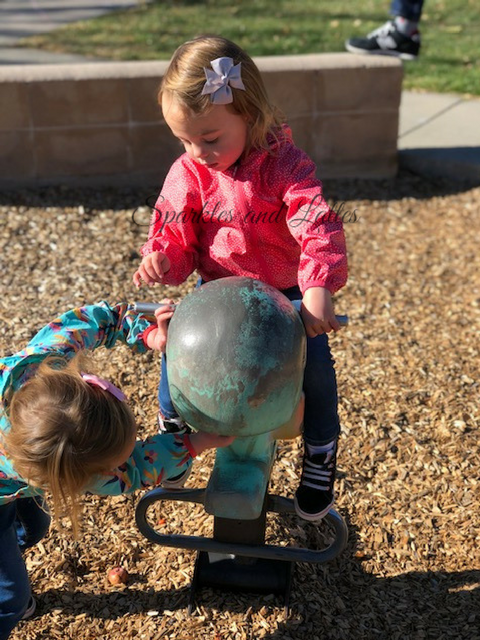 Christmas light looking, Santa train, ornament making, baking cookies, Christmas Eve party, the girls 3rd birthday and so much more. I am starting to plan out the girls 3rd birthday party. I threw around ideas of having it at a bounce house place, the trampoline place and then at home. I think at home is going to win it over again until they are a little older. But this time I plan to have it catered with some of their favorite foods. And by catered, I am thinking pizza, Chick fil-a nuggets and things like that. My best friend is making their cupcakes too. I am fresh out of those. I have never done it. This year we are planning to introduce our elf on December 1st. He is bringing Christmas pjs, Christmas books and Christmas socks to the girls. Every few days we will move him, but are not doing all the cutesy things (yet, next year). We are just letting the girls know that he is watching and reporting back to Santa. 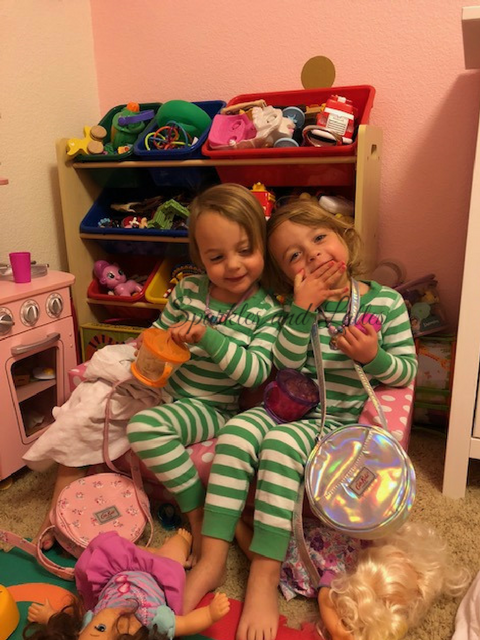 Then on December 20th, they are giving all of their pacis to the elf to take back to Santa, so he can give them to other babies who need them more than the girls do. I hope it works and we enter into the new year paci free. Fingers crossed. 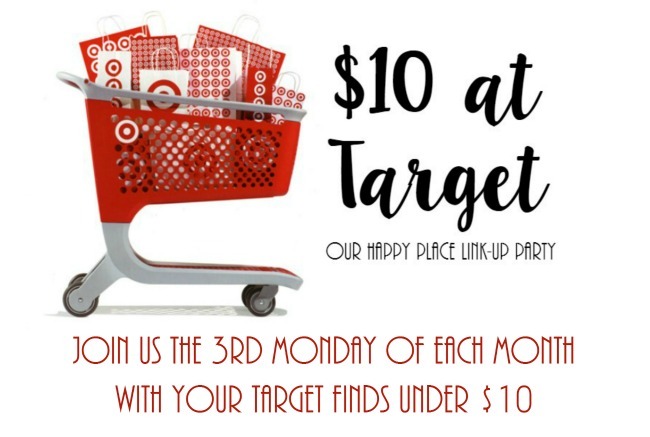 It the third Monday of the month which means $10 at Target time. I have been going to Target a lot lately because I have been searching for these dollar spot big puzzles. They have a Christmas theme and they are so cute. I have seen them on IG and I can't find them at my Target. Ugh. But I did find some other goodies there...several times. I have been to Target a lot this month. But this is one where I bought a bunch from the dollar spot. What did I buy on this trip? 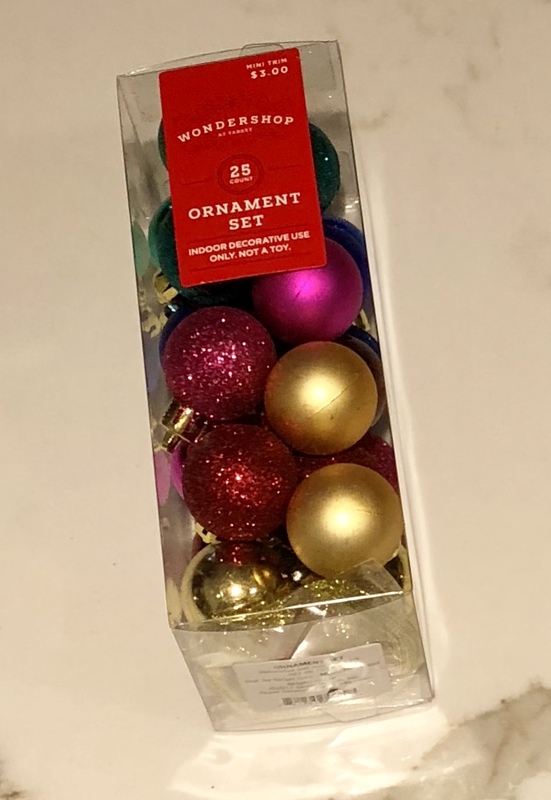 I bought some cute mini Christmas ornaments to go on a mini tree that I got for the girls' room. It is about 2 feet tall and 14 inches wide. It came with 35 lights and perfect for the girls. I bought the tree recently, but it is on sale right now for $14.99. 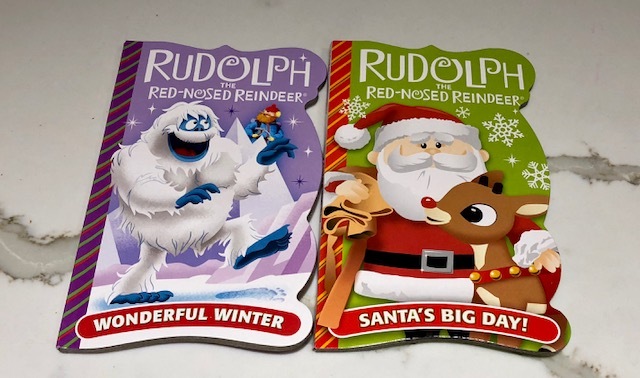 I loved the Halloween window gel clings that I got and when I saw these Let It Snow gels, I had to get them. We are praying for lots of snow this year, so we can have another amazing ski season. Fingers crossed. I bought these books to go with the girls Elf on the Shelf reveal. They are simple, cute and short. 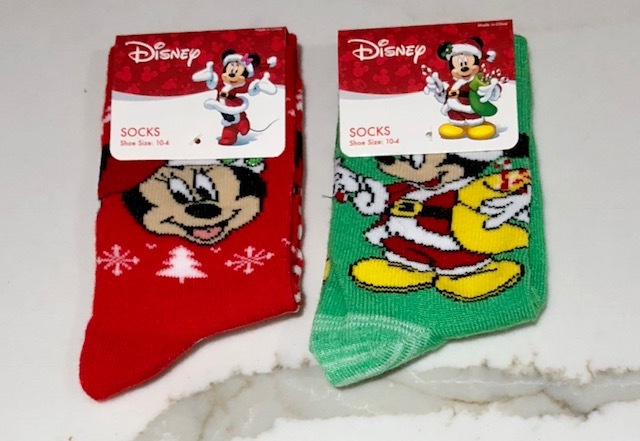 Just as I did with Halloween, I grabbed two pairs of Christmas socks for the girls. 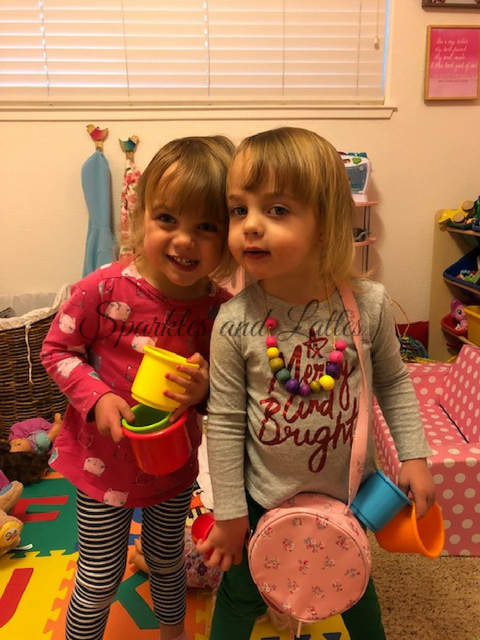 When I saw that they were Mickey themed, I knew the girls would want to wear them daily. So how did I do this month? What did you buy this month? Be sure to link up below. Thank goodness that it is Friday. This has been a long week as I have been battling a cold and on top of it, I have been single mommying it up all week. Rory comes home early this evening and I wish I was going out, but I will probably enjoy a glass of wine and get some more sleep. ONE. I have been trying to be good and not buy myself anything until after Christmas, but then J Crew Factory sends me an email saying 50% off everything plus free shipping. 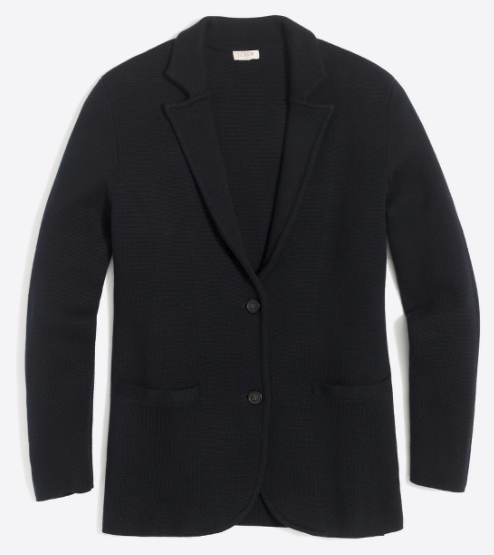 I have been eyeing this sweater blazer for awhile and I just couldn't pass it up. Plus I missed out on the one I wanted from Nordstrom a few months ago. TWO. Can you all believe that Thanksgiving is next week? We will be spending Thanksgiving with Rory's family this year. You won't want to miss the recap of this event. It involves costumes. Side note: I am totally bummed that I am missing out on Christmas tree cutting with my family and our family friends this year, but I am hoping my parents want to come out again with us on the Sunday after Thanksgiving. It is a tradition that I hate to miss. Plus I always decorate my house and tree that weekend, so I HAVE to go out and get a tree, ASAP. Have you all been Christmas shopping yet? I haven't, but I am about to start. I will do a lot of it on Cyber Monday. Plus I have been linking up with some amazing ladies and have put more on my personal wish list, plus added some to the girls Christmas list. THREE. I need your help. I need to grow my hair out before my sisters wedding in June as we are doing updos on the bridal party. Right now my hair is too short and I plan on only doing micro trims between now and then. But I want to grow it out quickly. So this is where you guys come in. I need recommendations on how to do this. I already plan to use more dry shampoo and not wash my hair as often (this will be hard for me), but I need other tips and tricks. Shampoos you can recommend? Vitamins? etc. FOUR. Remember how I asked if anyone wanted to exchange ornaments this Christmas season? 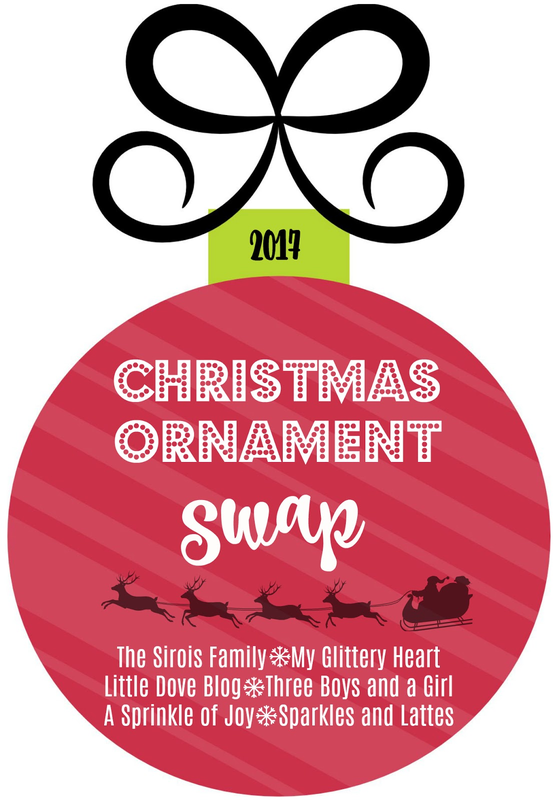 Well, five bloggers and I will be co-hosting a Christmas Ornament Exchange. * Sign-ups are open now. * You can fill out the form HERE. * You have until November 26th to fill out the form. Partners will be chosen and notified on the 27th. * We put a limit of $15 BEFORE shipping. If you don't spend $15 on your ornament, please feel free to put in some extra goodies. * Ship your ornaments by December 4th. * Come back here to link up on December 12th. 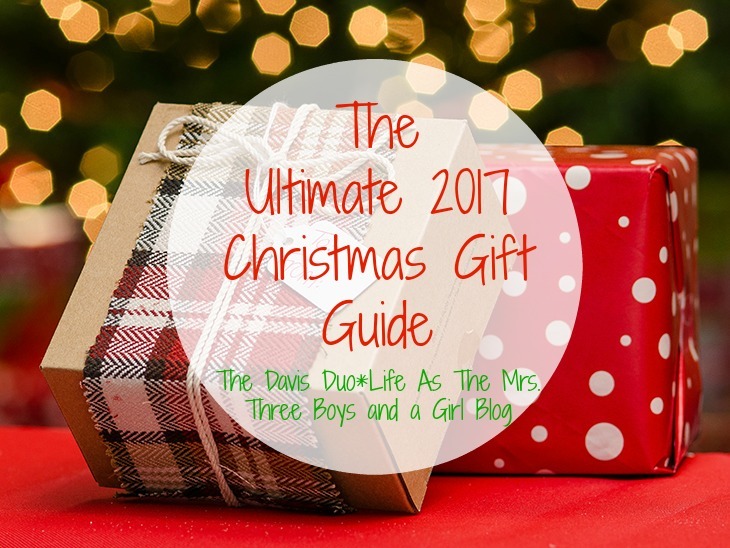 I am linking up with Owen (The Davis Duo), Emily (Three Boys and a Girl Blog) and Brittany (Life as the Mrs.) for another round of Christmas Gift Guides. This week's focus is women. I actually had a hard time picking things out for us ladies this year, but a bit of browsing on Nordstrom and I found several items I wouldn't mind receiving. I am sure you have been to Anthropologie and smelt their candles. If you haven't, you must. My favorite is their Capri Blue Volcano scent. 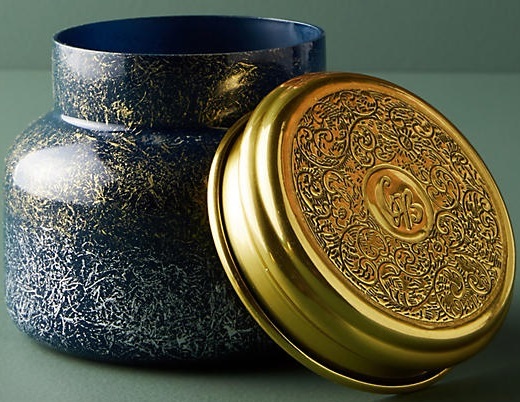 It is my go to scent and I buy a candle every time I go in an Anthropologie. I am always wanting a new purse. 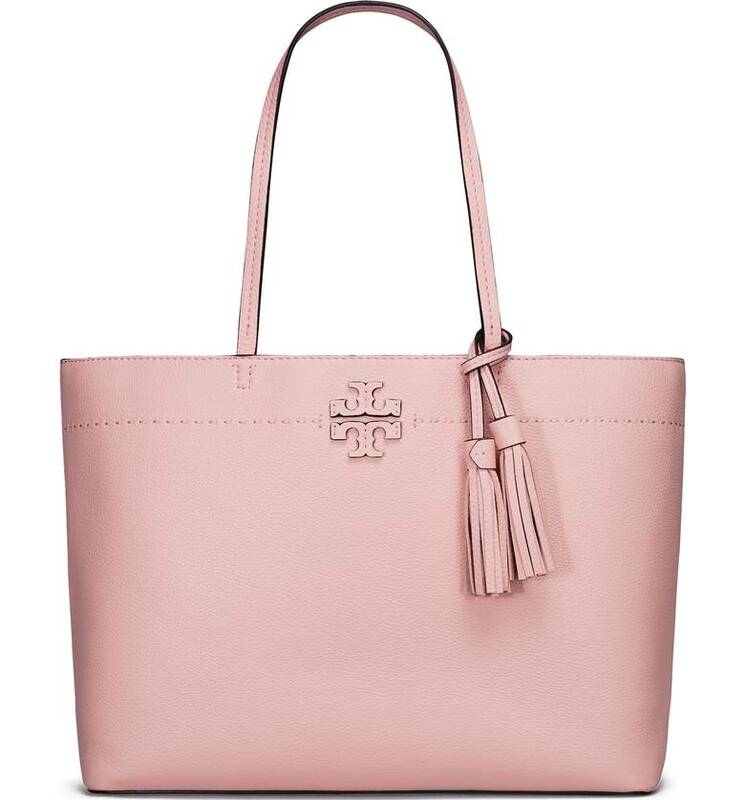 When I saw this blush Tory Burch purse, my heart fluttered. Isn't it beautiful? Every year I talk about these butter socks. They are from Nordstrom and they are one of my favorite gifts to give. I even gifted them to the girls teachers last year for Christmas and their new teachers will be receiving them as well. 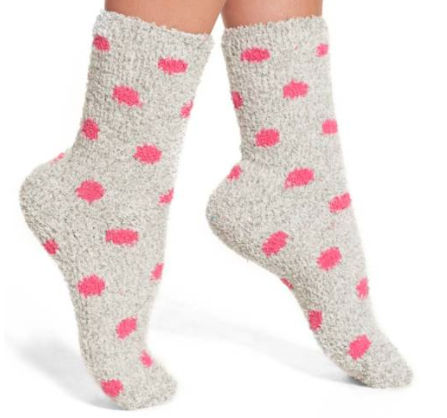 They are soft, like butter and perfect for the winter. 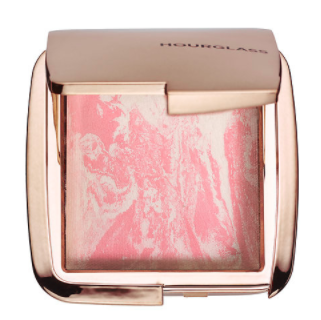 I don't wear blush that often, but when I do, I buy Hourglass Blush. I love the glow it gives you and it is beautiful on any skin. 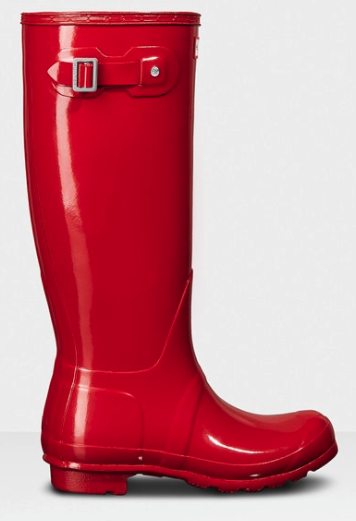 We all love our Hunter boots and I have a black pair that I wear often. I want another pair and I think these red ones are beautiful. I chose the glossy ones this time whereas I have the flat black already. I love all of my Kendra Scott jewelry. 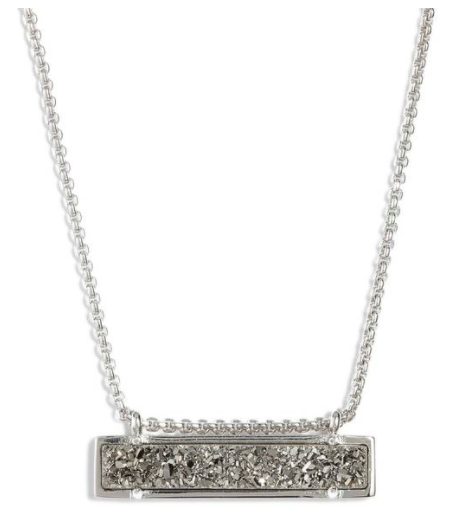 I have always loved a bar necklace, so when I saw this one, it stuck out. It has the bling to it and it is simple. I still haven't bought a pair of slippers to replace my ones that have a hole in them. But I saw these and wanted them immediately. 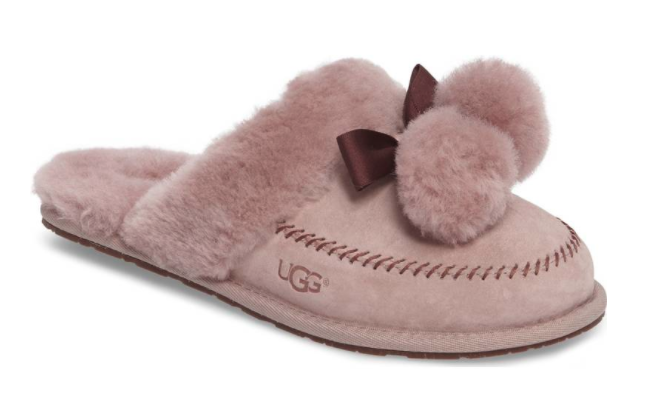 I am replacing Ugg slippers that lasted about 6 years, so I am hoping these would last as long. So pretty. 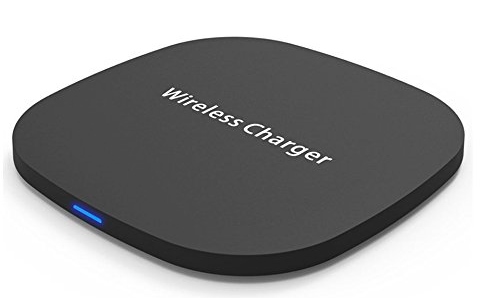 Since I bought an iPhone 8 Plus, I need a wireless charger. Well I don't need one since you can charge it via cord, but I want one for work. I have used my co-workers before and it works great. Especially when you want to listen to Pandora at work and it burns your battery.